About "NKJV Holman Study Bible Suede/Chocolate"
Holman NKJV Study Bible, launched in September 2013, is a new edition modeled after Holman Bible&'s own 2011 ECPA Christian Book Award-winning HCSB Study Bible as well as the Holman KJV Study Bible, where every well-conceived study help is practically placed on the same page spread as the related biblical text. It also features 15,000 study notes, 141 photos, 62 timelines, 59 maps, 40-page concordance, 20 articles and essays on practical and theological issues, 16 illustrations and reconstructions, and 15 charts. 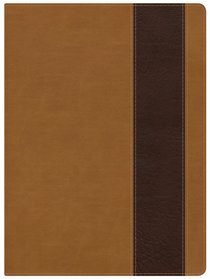 Customer Reviews For "NKJV Holman Study Bible Suede/Chocolate"
This study Bible is modeled after the 2011 ECPA Christian Book Award-winning HCSB Study Bible. The study helps it contains include 15,000 study notes, 141 photos, 62 timelines, 59 maps, 40-page concordance, 20 articles and essays on practical and theological issues, 16 illustrations and reconstructions, and 15 charts. These features of the study Bible help to make the Scriptures clear and understandable. Any serious student of the Bible would certainly want to own a copy of this study Bible.